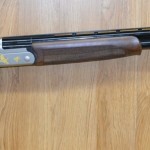 One of the best value shotguns for a person starting out in shotgun sports. The CZ Redhead is sure to impress with its beautiful wood grain and well finished casing. The 28″ multi chocked barrel gives good shot patterns, and though testing we have fired over 6000 shells through without any issues. A reasonably priced step into the sport.